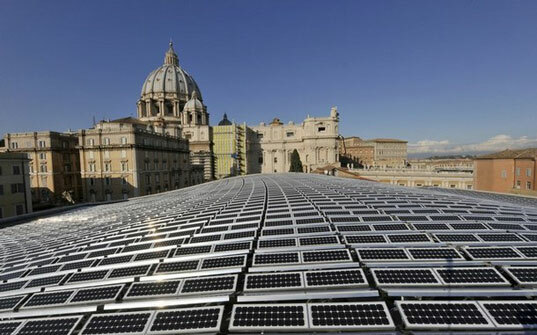 Vatican Goes Solar with $1.6 Million Array! Since he was elected in 2005, Pope Benedict has drawn the attention of the faithful to “the unbalanced use of energy” in the world and has remarked that environmental damage is making “the lives of poor people on earth especially unbearable”. The Nervi Hall solar array is a concrete example of this new, greener pope. Designed and built by architect Pier Luigi Nervi in 1969, the Paul VI auditorium—a.k.a. Nervi Hall—had a cement panel roof in serious need of replacement. The new solar array, donated by the Germany companies SolarWorld and SMA Solar Technology, is expected to produce about 300 megawatt hours (MWh) of energy a year, enough to light, heat or cool Nervi Hall. When the hall is not in use, the energy is to be fed into the Vatican’s main power grid. The initiative is an attempt to make the Vatican “a little bit greener,” according to Andre Koekenhoff, one of the workers on the Nervi project. “With this plant, if it is working, in about two weeks we avoid 200 tonnes of carbon dioxide, and this is the equivalent to 70 tonnes of oil,” he told the Associated Press news agency. Certainly it is a step in the right direction. These panels were donated by the president of a German PV manuf. there were no cost to the Holy See. Papal social policy is not typically characterized as progressive. 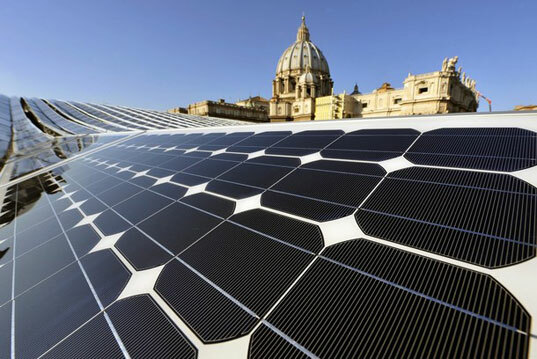 Flying in the face of this perception, Vatican City has just installed 2,400 photovoltaic solar panels on the 5,000 square meter roof of Nervi Hall where popes hold general audiences when the weather is poor. The 1.2 million euro ($1.6 million) system went live earlier this month just hours before Pope Benedict held what is being called the "first ecological general audience in the Vatican."